Living on the Gold Coast we all know that temperate weather means a little more attention is required towards hair growing in places we don’t want it to! Luckily for us, our treatment options are endless. There’s DIY; shaving or waxing, in-salon; sugaring, threading or dermaplaning and there’s also an even more permanent solution; LASER. 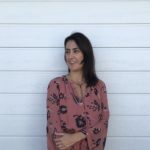 I sat down to chat with owner and operator of The Laser Lounge Robina, Linda to discuss all things permanent hair removal with Laser. 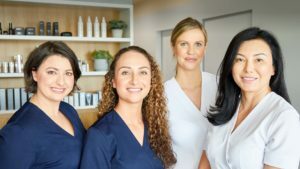 This laser and skin technician has been in the industry for 20 years and clearly is passionate about helping others achieve what can sometimes be a life changing goal. Laser is a device that emits light through a process of optical amplification, basically it is a tube that concentrates light over and over until it emerges in a really powerful beam. LASER is an acronym for Light Amplification by Stimulated Emission of Radiation. 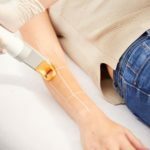 Are there certain skin types/hair colours that don’t respond as well with this type of Laser? Can all skin types be treated safely? The type of laser used at the Laser Lounge Robina is a Cutera model. Both fair and dark skin complexions can be treated safely with this type of Laser. For laser to be successful, the hair must be darker and thicker. Blonde, white and grey hairs do not respond. Some red hairs may or may not respond. The Laser Lounge Robina, offer a test patch to those people who are not sure if their hair colour is suitable. Just about any part of the body can be treated except the orbital rim. Which means under the brow/eyebrows cannot be treated. You should avoid treating any lighter fluffy hairs, as this can lead to stimulation! Permanent results can be seen in a minimum of 6 but most need closer to 10 sessions. When treating the face you may need on-going treatments as this is a very hormonal area and new hairs are naturally stimulated very easily. We advise on average to treat torso, legs and arms every 8 weeks, pubic areas such as bikini and underarm, and face every 6 weeks. There may be some clients needing different intervals due to hormones, genetics or lifestyle factors so we design a treatment program to suit. With the Cutera machine it has a cold tip that drops to 4 degrees, this cold sensation not only helps to make the treatment more comfortable but also protects the surface of the skin. We glide the tip along the skin during the treatment making it as comfortable as we can. 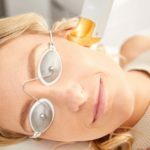 Why do clients choose the Laser Lounge? The Laser Lounge is always keeping up to date with latest technological advances and constantly training and reviewing staff, we only use premium medical grade machinery. Clients like coming to us because we are very health and safety conscious, we design the treatment plan for you and we are thorough in our services whether it is in laser, skin or cosmetic treatments. Treatment with Laser was exactly how Linda described it. I had Laser on my underarms and felt only a subtle prickle disguised by the coldness of the laser tip. After a thorough consultation to discuss my needs, the Laser treatment took just minutes to perform. Later that afternoon, there was a slight sunburn feeling as Linda had warned me, but that was very mild and short lived. Six weeks later after only one laser session, I have seen a significant reduction in hair growth. Typically you can expect to see a 10% decrease after the first session but I would put mine more at 30-40% reduction in hair growth. So if you’re bothered by hair and want it gone. Why not give permanent hair removal with Laser a try. As always, do your research as not all Lasers are the same.